Nickelodeon Teenage Mutant Ninja Turtles Toddler Boy's Fleece Bathrobe Just $7.79! Down From $32.00! You are here: Home / Great Deals / Nickelodeon Teenage Mutant Ninja Turtles Toddler Boy’s Fleece Bathrobe Just $7.79! Down From $32.00! 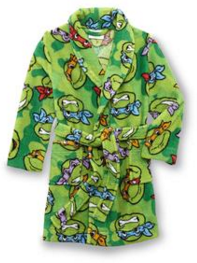 Nickelodeon Teenage Mutant Ninja Turtles Toddler Boy’s Fleece Bathrobe Just $7.79! Down From $32.00! Sears has this Nickelodeon Teenage Mutant Ninja Turtles Toddler Boy’s Fleece Bathrobe on sale for $7.79 (Reg. $32.99)! After a bath, he can cuddle up with his favorite half-shelled heroes, The Teenage Mutant Ninja Turtles with this toddler boy’s fleece bathrobe from Nickelodeon. With a shawl collar and long sleeves, this plush robe features images of Michelangelo, Donatello, Leonardo and Raphael.